$28.50 per customizable laptop or tablet sleeve. Three sizes available for 10", 13-14", and 15-17" laptops and tablets (iPad). Lightweight and water resistant neoprene. 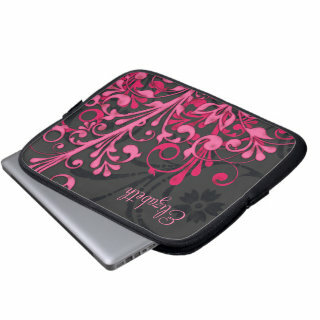 You can personalize the name on this black and hot pink abstract floral laptop sleeve. To change the name, use the personalization tools on the Zazzle website. Elegant and pretty for a woman who loves bold color. Sized for 10" laptop or tablet. Fits iPad tablets. Most designs can easily be changed to one of the alternate sizes on the Zazzle website. Protect your laptop with a custom laptop sleeve. Made with 100% neoprene, these lightweight and water resistant sleeves look great with their vibrantly printed full color designs. Perfect for travel or just day-to-day use. Many designs are set up as templates that can be personalized and you can add your own custom text to any of our designs. Choose between three different sizes. Sizes for 10", 13-14", and 15-17" laptops and tablets (iPad). Prices vary with size. Please allow 5-8 business days for manufacturing plus any additional shipping days. Zazzle electronics bags are printed and shipped in the US, even if ordered off of international sites. Please allow sufficient time for international shipping.